Are you ready to begin Bible Journaling, yet feel hesitant to write in your Journaling Bible for the first time? 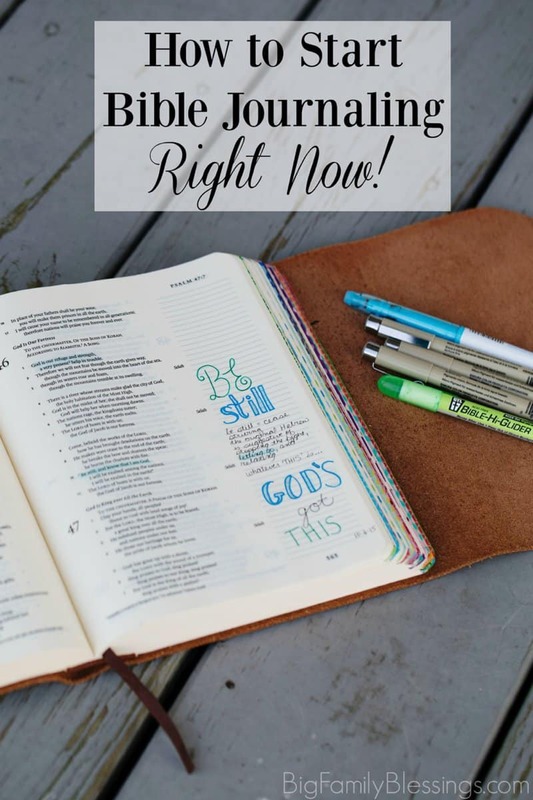 This post will help you learn how to start Bible journaling right now. Don’t go one more day without beginning your own journaling adventure. If you have a Bible Journal, chances are you spend time online looking at all the beautiful ways other women journal in their Bibles. It’s easy to get overwhelmed with all Bible Journaling options and ideas available. 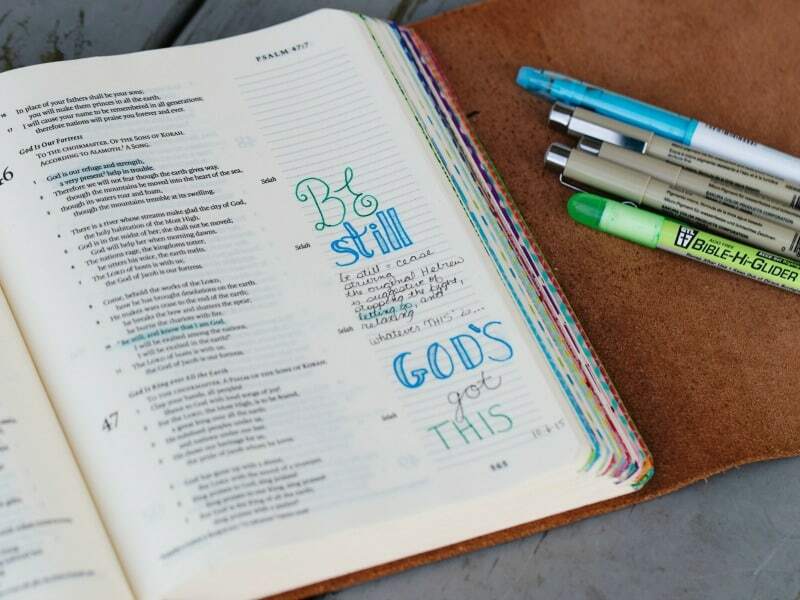 The most difficult part of Bible journaling is often simply getting started. Change that today! Simply grab your Journaling Bible and something to write with, take a deep breath, and follow these simple tips for getting started Bible Journaling. At minimum, you need a journaling Bible, a pencil with eraser, and a black pen. I also recommend a pack of colored pencils. Crayola Twistables are inexpensive and a great pencil to start with, but any colored pencil you have at home is great. Choosing the first scripture passage to journal can feel overwhelming. Once you journal a few passages, deciding what to journal will come easily. Did you have a favorite scripture as a child? What verse was discussed during the last sermon you heard? Do you have a favorite Bible story? What about your child’s favorite Bible story? Are you praying for something big? Or had a recently answered prayer? Journal it beside a Bible verse related to prayer. What is the last scripture you memorized? Another great option is journaling with one of Illustrated Faith’s Devotional Kits. You’ll find a 14 day devotional, along with everything you need to journal as you complete the devotional. Not only will you jump right in with 14 days of Bible Journaling, but you will also end up with some fun Bible journaling supplies and techniques. Remember there is no right way to use your journaling Bible. Your Bible journal will be as unique as you are- and that is exactly how it should be! Don’t stress about writing on those blank spaces, just do it! I’ve shared 8 different ways to use your journaling Bible, with ideas for those who prefer writing, note taking, doodling, or artistic illustrations. After reading, studying, and praying over a passage of scripture put your pencil on the paper and journal. You might write a prayer, or what God impressed on your heart, or illustrate the verse. If you aren’t very artistic, but desire pretty pages in your Bible, my Bible Journaling Hacks for the Artistically Challenged post might be helpful. Add color with colored pencils or pens. Use washi tape to add color and texture. Doodle in the open spaces. Add stickers or stamps (scrapbooking supplies work well for this). Be sure to date each entry in your Bible Journal! That’s it! Your first entry in you Journaling Bible is complete! The more you journal, the easier it will become! What will the first entry in your journaling Bible be? My first entry was Wednesday! Lol, started in the beginning because well it just looked like a good place to start! I'm excited to start journaling because I will give it my undivided time. Maybe I will treat myself to some kits. Awesome! Congrats on your first entry! Wonderful,Blessed informative and helpful site.God Bless you..